London is one of the world’s film making hotspots, so it makes sense that those looking to study the medium, and how to master it, will find themselves drawn here. Amy has always loved film making, and wants a career in film editing. “It was clear to me that LSBU’s degree would set me on the right path, and help me to get where I want to be,” she says. Our new facilities have certainly played their part in helping Amy get her career off the ground. “Elephant Studios is a great facility, with impressive editing suites,'' she says. The studios are great to work in too – the lighting is so impressive that I’ve filmed scenes in there that you would never know were shot in a studio. All in all, it’s a very impressive, professional space. Two of Amy’s highlights so far have been the chance to undertake a six-week workshop using ARRI cameras and the opportunity to learn how to grade films in DaVinci. “I don’t think a lot of other universities would give you the chance to spend so much time with ARRI cameras and when it comes to DaVinci and grading,” she says. The university makes you feel as though you’re not a student, but part of a real-life post-production house grade suite. 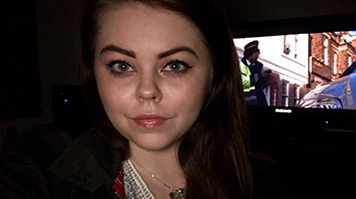 Alongside the technical skills that we instil into our film students, we also stress the importance of networking and being pro-active – skills that Amy has certainly demonstrated when it comes to her dissertation. For Amy, however, the chance to speak to the pair was only part of her reward for showing such initiative. “They’ve offered me the chance to sit in with them while they edit the second Fantastic Beasts film,” she says. When I first sent that email, I did not expect to be sitting in on an edit with David Yates and Mark Day in a million years, but it shows that if you are prepared to put your name out there, it can help you to get a foot in the door. When she has finished her studies, Amy hopes to head to the United States to continue her training and get a feel for the film industry over there. “My goal is to one day get into a long-term collaboration with a director and make films as successful as David Yates and Mark Day have done,” she says. BA (Hons) Digital Film and Video is now called BA (Hons) Film Practice.